A complaint has been made to the Parliamentary Commissioner for Administration (Ombudsman) stating that despite qualified personnel were selected after a formal examination for the post of divisional officials in National Child Protection Authority, some other individuals are being given appointments with political influence casting away the list of selected candidates. The complaint has been made by 116 persons who had been selected after a formal process. The complainants have also submitted a list of 66 persons from the list of 116 who have been earmarked for political appointments. A writ petition filed by former Chairman of National Child Protection Authority Attorney at Law Ms Marini de Livera at the Court of Appeal too carries information regarding this matter. The subject Minister Chndrani Bandara has instructed the relevant officials to give priority to the list of 66 persons she had sent and if there were more vacancies to fill them with the persons from the qualified list. Among the list of 66, there are only 13 who are qualified for the appointment ay reports. Despite sending letters to the President, Minister Chandrani Bandara, the Chairman of National Child Protection Authority regarding the injustice they have been subjected to, there hasn’t been any response from any of them say those who are in the qualified list. Recently, they have met the Prelates of the three Chapters regarding the matter. The National Organizer of the JVP Parliamentarian Bimal Rathnayaka had sent a letter to the Prime Minister with letters to the media revealing this matter. As investigations are not properly carried out those who are qualified and have been selected are wasting time due to the negligence of the authorities. Now, it has been reported that Ombudsman has decided to carry out an investigation regarding the matter. The JVP is making preparations to distribute leaflets throughout the country to apprise the public regarding the ‘20th amendment to the Constitution, that has been presented to parliament as a private members motion. The leaflet campaign will be launched on the 2nd of July. The decision to launch the leaflet campaign has been taken by the Political Bureau of the JVP on a suggestion made by Parliamentarian Sunil Handunneththi. Mr Handunneththi has said those who had created phantoms about the amendment even before it was presented have now gone into hiding once the draft was presented to parliament it was published. He said they had a lot to say about the draft they had not seen but now the draft has been published; they have gone into hiding and added that phantoms have been silenced. Mr Vijitha Herath agreeing had said it is the people who have to confront the issues and the leaflet distributing campaign should be carried out with any delay. As everyone has agreed the campaign is to be launched on the 2nd say reports. Sandhya Eknaligoda, the wife of journalist Prageeth Eknaligoda, speaking at a media meeting has asked the President to affirm the safety of her and her two sons. Ms Sandhya Eknaligoda states a group including Ulapane Sumangala Thera, who acts as an adviser to President Maithripala Sirisena is threatening her and her sons through social media. She says the person who directs threats against her and her sons also performs as an advisor to the President. She says fabrications are being spread involving the Ambassador to the USA which is harmful to the country diplomatically. She further asks the President to take measures to stop the ignominious act being carried out by certain members of the Maha Sangha and protect her and her sons’ dignity and lives. 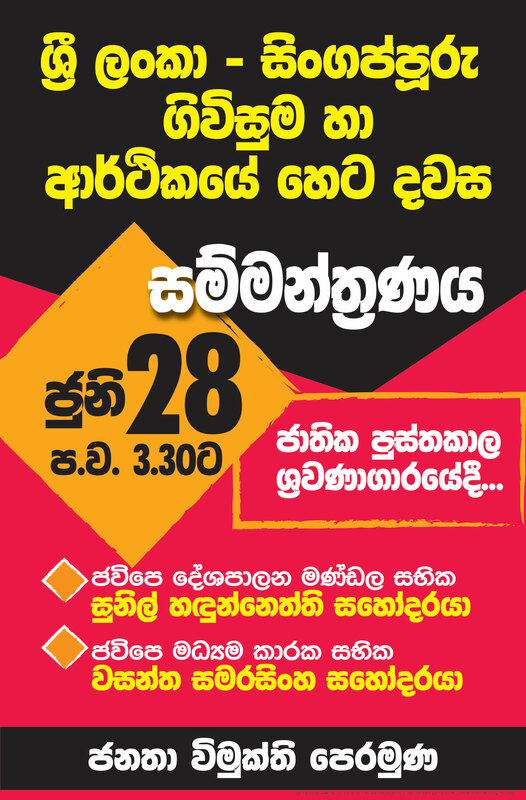 A seminar under the theme ‘Singapore agreement & the future of Sri Lanka’s economy’ organized by the JVP will be held at the auditorium of the National Library in Colombo today (28th) states the media unit of the JVP. The Member of the Political Bureau of the JVP Parliamentarian Sunil Handunneththi and its Central Committee member and the President of Inter Company Employees’ Union (ICEU) Wasantha Samarasinghe are scheduled to address the seminar.